The collapse of dimensions that Virilio calls the dromosphere is just the most recent account of the destruction of experience informing the modern condition (see Giorgio Agamben, Infancy and History). Flash Reason (deliberative reason in electracy) is a retrieval and updating of the virtue of Prudence (metis), which is the capacity to size up the contingencies of a situation in the present in a glance (Augenblick, moment), draw upon a stock of maxims derived from experience, use judgment to make a decision leading to a desirable outcome in the future. What must Prudence be in the dromosphere? 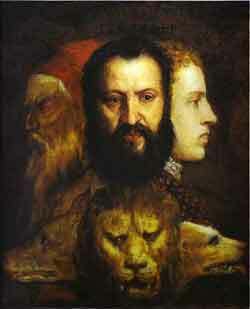 Let Titian’s Allegory of Prudence be an assignment, with one response modeled in this blog, as a relay guiding the invention of an Internet Public Sphere. What is my (your) allegory of prudence (of a time-image), today? The challenge, as Agamben explained, is that the subject capable of having experience has been incorporated into the experimental sciences and suppressed. What counts as knowledge today is only that which is inexperienceable. The maxim (and proverb) have lost authority, to be replaced by the slogan (commodity logic). The grounds of the old experience (common sense) are not recoverable, and in any case that is not the issue in electracy. The issue today is not so much immediate experience, but the experience of avatar. Avatar as prosthetic experience. The new dimension for which a capacity of experience is emerging has already been surveyed: the unconscious. Avatar interfaces datasphere/unconscious. Who or what must be prudent in electracy? Not me, but us, through avatar. When? Now.